Slowly and steadily the river has been rising for a couple of days now but without any really warm weather or heavy rain it has been a painfully slow process this year and enormously frustrating as we wait here in Camp to be able to get going. At eleven last night the massive ice field at the village detached itself and came past us, to the sound of whoops of joy from Maryke and Bill who were on watch. For several minutes all we could see was a white river of ice moving sedately to the White Sea. The river is up about 10" overnight and today we expect to see a great deal more ice coming through. Feodor, our Head Guide, thinks that he might be able to put one of our smaller boats in the river this evening, a sure sign that fairly soon normal Varzuga service will be resumed. With damp weather forecast, and Glenn’s workshop full of engines ready to be mounted on boats, we adapted the veranda as a temporary, dry work area. Glenn and Bill managed to get a couple of our oldest engines up and running as spares if needed. 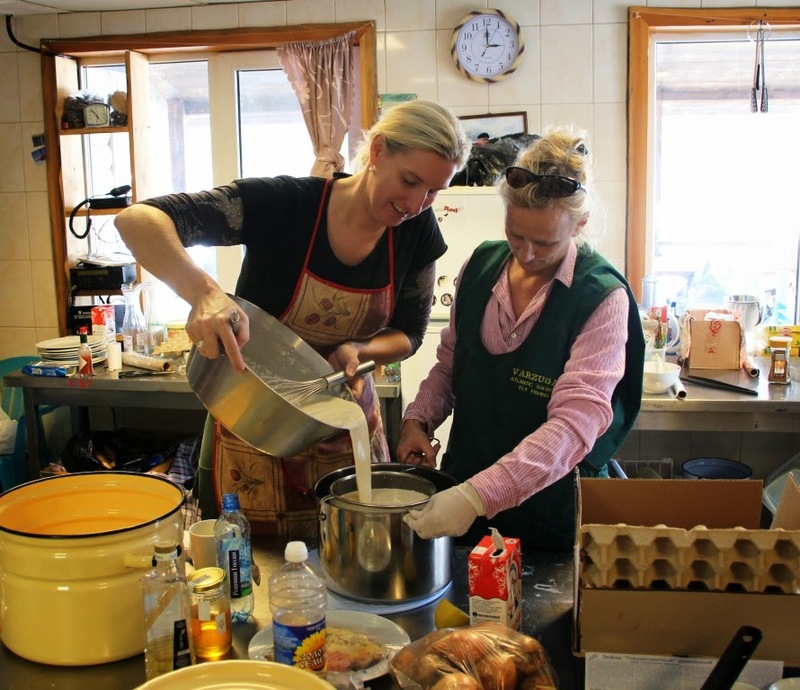 The girls went up to the village again for more supplies, and in order to give us a good head start when our guests arrive this weekend have been preparing masses of food for the camp freezers - the Crepes Suzette look very good! At Kitza and Middle Camp we have the same Russian staff this year, all local people and with years of experience - they know exactly what to do once we get into camp and they will work around the clock to be ready for Saturday evening. Although Terry Mallin at Middle is new to the river, he has Donna, in her eighth year on Varzuga, with him and he has had 10 days here learning the ropes. It is a really solid team this year, and they are itching to get going. Next week’s fishing is going to be ‘the first week’, great news for Lower Camp as this is normally the most prolific week of the season. I would expect the water to be colder than usual and perhaps a bit higher, particularly on Kitza. That said the height is going to depend on air temperatures and rainfall; we have plenty of snow in the watershed still and a quick melt will bring a high river. It is definitely worth being prepared with a reasonable range of sinking tips and some heavy flies – a standard choice would be a Willie Gunn or Ally’s Shrimp on a 1" or 1½" brass tube. A pair of fleece trousers or similar to keep you warm when wading would be wise to pack. I’ll keep you posted on developments from here, Terry has his remote controlled helicopter on standby and we’ll try and get an aerial photo or two of the river once the wind drops and we can launch it.